Fennel originates from the Mediterranean region where the Ancient Greeks first discovered it. Over the centuries its popularity grew, and its cultivation spread around the world. The essential oils taste like “black licorice” because it contains anethole. People eat the root as a vegetable and use the seeds as a culinary spice. In medicine, this carminative herb treats “flatulent dyspepsia” to help promote digestion and relieve cramping associated with bloating and gas. Herbalists frequently combine stimulating laxatives with fennel seeds to reduce the griping pain produced by these laxatives. Research also suggests fennel can improve some symptoms of irritable bowel syndrome (IBS). Female complaints also benefit from fennel because it balances female hormones. Anethole appears to modulate dopaminergic receptors that control prolactin release, and this explains why fennel has long been used as a galactagogue to promote lactation. Research suggest fennel can help encourage the menstrual cycle in those suffering from amenorrhea and oligomenorrhea. Fennel also helps improve some menopausal symptoms including low libido and vaginal dryness. 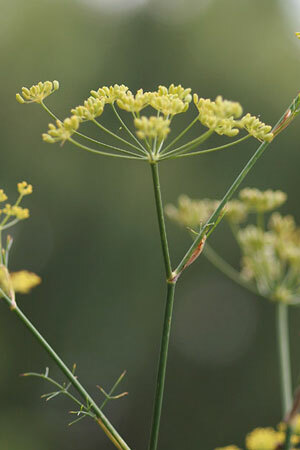 Anise (Pimpinella anisum) belongs to the same plant family (Apiaceae) as fennel. Both plants contain essentially the same phytochemicals and thus share the same medical properties. You can use them interchangeably in practice.